When you decide to be a little more eco-friendly about your exercise habits, it usually just means you toughen up and start jogging outdoors. That is an ideal solution, but not everyone can or wants to do that, especially when it’s a cold rainy morning. 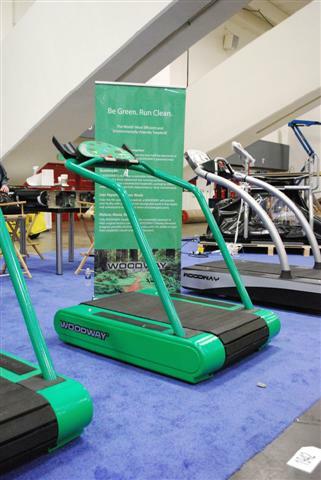 Well this EcoMill allows for you to workout indoors and still keeps things eco-friendly. Not only do you get your exercise, but you generate enough electricity to power the treadmill. Making it so that you don’t have to plug this into the wall and use even more energy. While you’re exercising it charges the battery and then in turn keeps the display up and running. It does this by utilizing Woodway’s near frictionless drive system. Even if this might not be the best option for an at home gym, it’d be a great addition to a commercial gym. It would also save them a little on the power bill, not to mention attract members that want a more eco-friendly experience. It is a bit on the expensive side though, which might make it hard for some to afford it. You can purchase it in either black or green for $8,500. the author must live in the south. What about us poor northerners. Who need a gym 8 months out of the year.